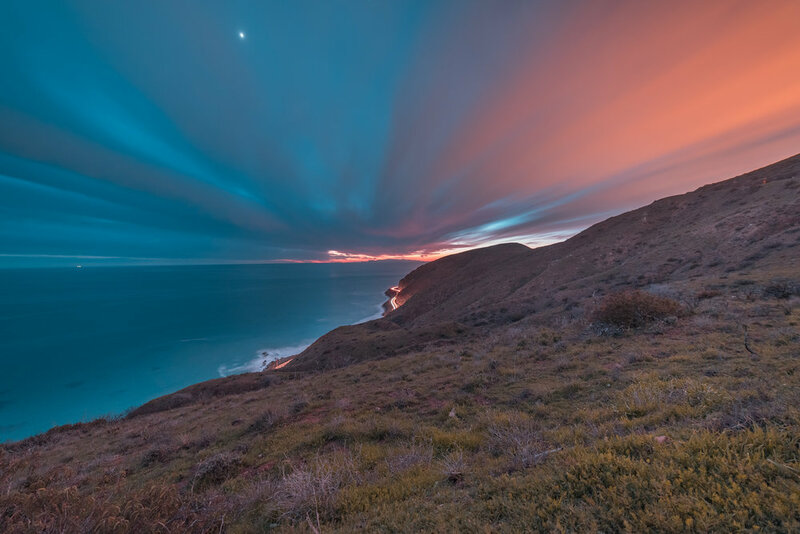 Deer Creek Canyon, Malibu, CA. ISO 640. f/4.5 30 seconds. 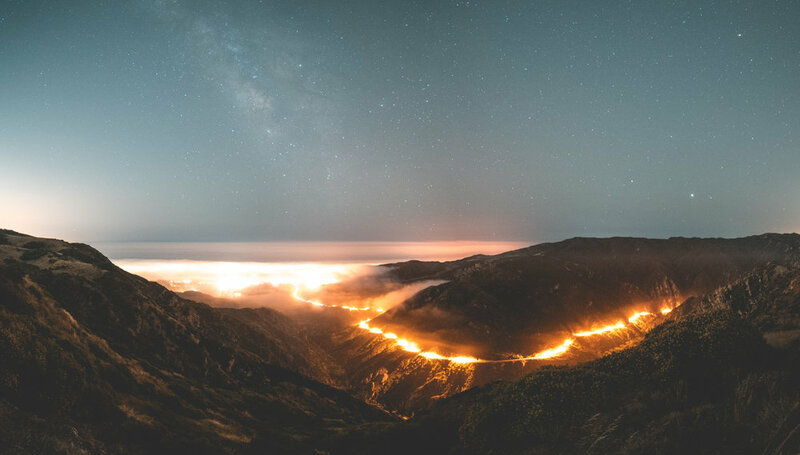 Do you ever wonder how photographers manage to catch such stunning images in the nighttime? Is it photoshop? Is it a special camera? It does not necessarily come down to what camera you are using, but more of how you know how to use that camera. In this blog I will talk about things such as exposure, focus, and most importantly COMPOSITION. 1.) What settings are you going to use to acquire your desired look? 2.) How high is too high for ISO capability on your camera? 3.) Is there light around/near you (even minuscule light) to help brighten up your foreground? 4.) How are you going to make this shot interesting and eye-appealing? ISO 3200, f/2.8, 10 seconds. 1.) What are you trying to shoot? I know this sounds very basic, but it is extremely important to keep in mind for several different reasons. Without a plan, you will never be happy with your image. A key factor in shooting the Milky Way is actually setting yourself up to see it. Although it may not seem like it, Milky Way photography takes a lot of planning and scheduling. There is a certain time of the year where the Galactic Core rises/sets above the horizon when it is dark enough to see it. For where I am from, it is during the spring/summer (West Coast). I believe it is the same for the rest of the U.S. as well. Other places around the world may take more research to know exactly when the ideal time of the year to shoot it would be. Once you have a basic idea of when during the year you are going to want to shoot, you also have to take into account the moon cycle. The more full the moon is, the more the sky will be dimmed out by its' light. The less full it is, the darker the nightsky will be, allowing for the light of the stars to be brighter. This is what you want. Now that you've read this, you will be thinking "awesome, the next time it is the new moon of the moon cycle I am going to shoot the Milky Way!" I have a little special tip for you that I consider myself; although shooting the Milky Way at new moon will provide you with the most detailed Milky Way and brightest stars, it is difficult to shoot any type of foreground due to there being 0 light on it. I find my most successful astro shoots are when it is 1-3 days before and after the new moon cycle. Now let's talk settings. There are 3 things to consider when it comes to getting the proper exposure: ISO, shutter speed, and aperture. I am sure you understand the basics of these if you are a photographer but it gets a bit more technical at night. ISO is what you are going to want to base your exposure upon; the higher you boost it, the more sensitive your camera sensor will be the the light (just like film speed when shooting film). You also have to remember that the higher your ISO, the more grain will be in your photo (I will talk about this in #2). 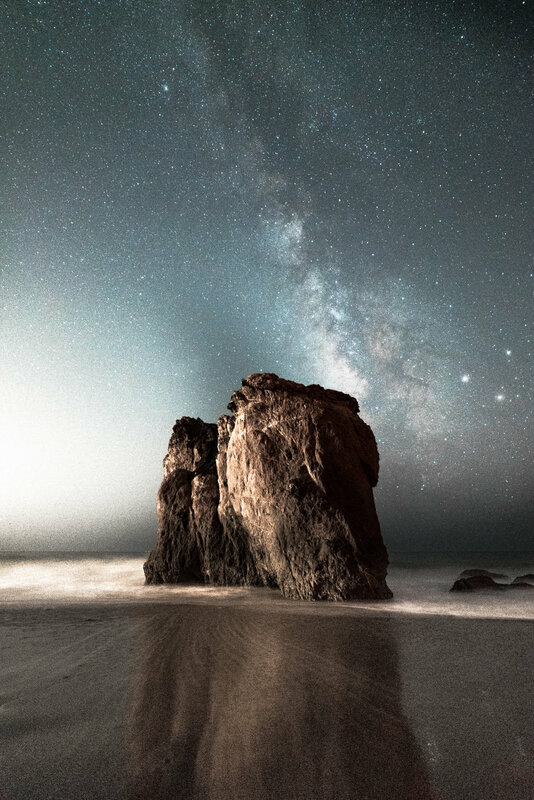 With astrophotography, you have to accept the fact that your photo will be somewhat grainy; the only way to get a proper exposure in the night is with high ISO levels. There are ways to reduce the amount of grain, such as photo stacking or star tracking. I am not going to talk about these in this blog due to the amount of information and steps in both of these options, but they can be studied through a simple google search. You must also keep in mind that the Galactic Core rises and sets just as the sun and moon. As our Earth rotates, the stars move throughout the sky. The longer your shutter speed, the more star drag you will have in your photo. Star drag isn't always a bad thing, especially when you like this look, but if you are trying to get the sharpest possible Milky Way image, you want to avoid star drag. The sharper your stars, the more clean your image will look. Longer focal lengths are more compressed, and call for shorter shutter speed times. I prefer to shoot with a wide-angle lens due to this factor; with my 14mm lens, I can have an exposure of 20 seconds with 0 star drag whereas with my 50mm, 8 seconds is the most I can go. After a while you get the hang of this and the proper settings come to your mind naturally. You want to keep your aperture as wide open as possible to get the most light. This is tricky, because the more your aperture is open, the harder it will be to get the proper focus. My 14mm runs at an aperture of f/2.8, and allows for good light. What I do to find a focus is zoom in on my live view, and try and find a star to focus on. Star drag in a long exposure. What I do to find a focus is zoom in on my live view, and try and find a star to focus on.If you are zoomed in and still can't find a star, try messing with your focus ring until you do see one. Once you find a star, zoom in all the way and adjust your focus ring until the star is at it's sharpest. ALWAYS SHOOT NIGHTTIME IN MANUAL FOCUS. Chances are, your camera is not smart enough to focus on a star (mine isn't). With all this in mind, use your judgement and make any adjustments you find necessary. There is no right or wrong way to do things in photography; these are just simply things I think about when taking photos in the night. 2.) How high is too high for the ISO on your camera? And here it is; "you're only a good photographer because you have a good camera". Although having a full-frame camera has it's advantages over a crop-sensor camera, both are capable of taking amazing photographs. I shot with a crop-sensor camera before upgrading to a full frame; it all comes down to how you make what you have work. I can run my ISO to 6400 at night and have little noise, whereas with a crop-sensor, anything over 1600 ISO will be far too grainy; so just remember the other ways to get a brighter photo (Shutter speed, aperture). If you are shooting with a crop-sensor, consider upgrading lenses to have a wider aperture to allow for more light. Pano; ISO 5000, f/2.8, 15 seconds. If there is 0 light on your foreground, it won't matter how long your exposure is, it will still be dark. As your shutter stays open, it burns all the light possible onto your sensor and this is how cameras capture dark scenes. Dim lighting on your foreground (from a small sliver of the moon or a dim light in the far background) will help your foreground come to life. This is how you see images with dramatic foregrounds complimented with the night-sky. You can also take 2 exposures (one for the sky, one for the foreground) and blend them together, but this can get messy. This is often overlooked by newer photographers; you get so amped up over seeing the Milky Way that you just set up your tripod, point your camera straight into the sky, and shoot. Pay more attention to what it is you are shooting. How are you going to add interest to your shot? Sure, the Milky Way is an amazing and beautiful sight by itself, but how can you compliment it? There are many different ways to go about this; leading lines, rule of thirds etc. but it really comes own to how you decide you want to compose your image. As i said above, there is no right or wrong when it comes to photography; do as you wish! ISO 5000, f/2.8, 10 seconds. These are just basic tips and tricks. Of course astrophotography is much more technical, but the only way to truly learn is to go out and practice. The more you go out and shoot at night, the more you will learn and the better your images will be. It has taken me over a year to get to where I am now! I hope this helps out anybody who is newer to photo, and if it did, please leave a comment and let me know. If you have any more questions regarding astrophotography, feel free to contact me at turner.nelson25@gmail.com . Thank you for reading, until next time.